And since the Detroit Lions aren’t playing (just you wait till next year), I will not be painting my face, dying my hair, and setting a couch on fire in the street. I can focus my attention on more controversial things. Like what to serve at the 2-person party I will be attending in my own house. If I were going to an actual party, I would bring something I could eat. Some people have enough will power to resist eating chips, chili, cheese, and beer without any “replacement food.” They take parties or social outings as an opportunity to practice intermittent fasting. I am not one of those people. I need compliant replacement food, or I will cave. Know thyself. This post contains affiliate links. Please read my disclosure policy for more info. There’s something about salted deep fried potatoes that goes well with…everything. And Americans love French fries about as much as we love football. That is to say, a lot. According to the FDA, the average American eats 29 pounds of French fries every year. Of course, we lectin-enlightened folk are not the average American, but we can still have our potatoes and eat them too, if they’re the right kinds! Disclaimer: these are not “replacement French fries.” They taste different, and that’s the point. However, if you are faced with a platter of reheated, deep fried potatoes or a platter of these, my hope is that the aesthetically pleasing colors and starchy texture will be enough to entice you to choose the right thing (that would be the Rainbow fries). Get the orange ones (sometimes called yams), not the white ones. 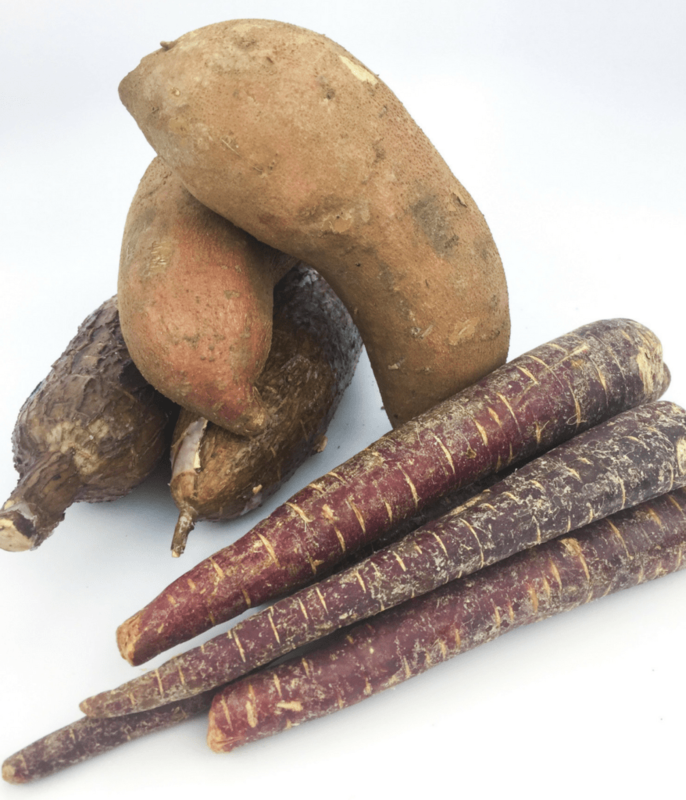 We want the deep orange for our colorful root vegetable trio. Not every grocery store carries yuca root, but if they do, you’ll find them near the tropical fruits and vegetables–think star fruit, mangoes, papayas. They can be anywhere from a few inches to a few feet long, and the outside looks like brown tree bark. If your store doesn’t carry yuca root, you could substitute parsnips. Purple carrots aren’t as sweet as their orange counterparts, and they have a gorgeous color, once peeled. Be forewarned: your hands/clothes may stain purple when working with these. Since purple carrots are somewhat of a novelty, you may be more likely to find purple sweet potatoes, which will work just as well. 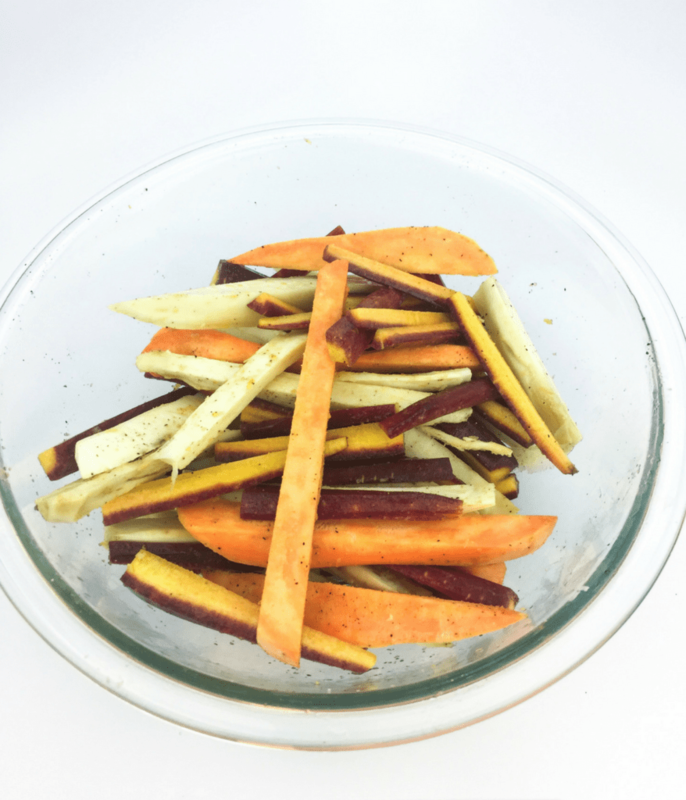 When you start peeling, you’ll see the beautiful inner cores of these root vegetables. You may be surprised to find that your purple carrots have an orange core (which makes them even cooler, obviously). Once peeled, toss them with oil, granulated garlic, salt, and pepper, then spread them out between 2 preheated baking sheets. 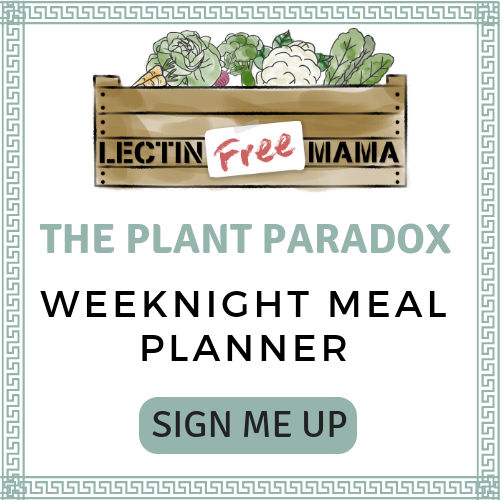 –> Get my complete lectin-free pantry checklist HERE! This one requires the most time and precision, which is why I sometimes skip it and lament my laziness later when some fries are burnt and others are soft. The more evenly sized your fries are, the more likely they are to crisp up. Use the biggest, sharpest knife you have to make prisms of perfection. Place the raw fries in a bag with the seasonings, and shake until all the fries are evenly coated. Then toss with the oil. Setting fries on a cold pan and sticking it into the oven is a recipe for soft fries. Preheat the pan first, quickly place the fries, and get it back in the oven. Each fry needs its own space to “breathe.” If other fries are crowding it, the oven heat will not evenly distribute, and that fry will not get its fair chance to crisp. Give your fries a chance! If all else fails, and your fries came out soggy, your redemption is in the dip. My all-time favorite dip requires two ingredients: sour cream and mustard. It’s delicious and so dang simple, you can probably forget to make it and find these two ingredients in your host’s fridge. 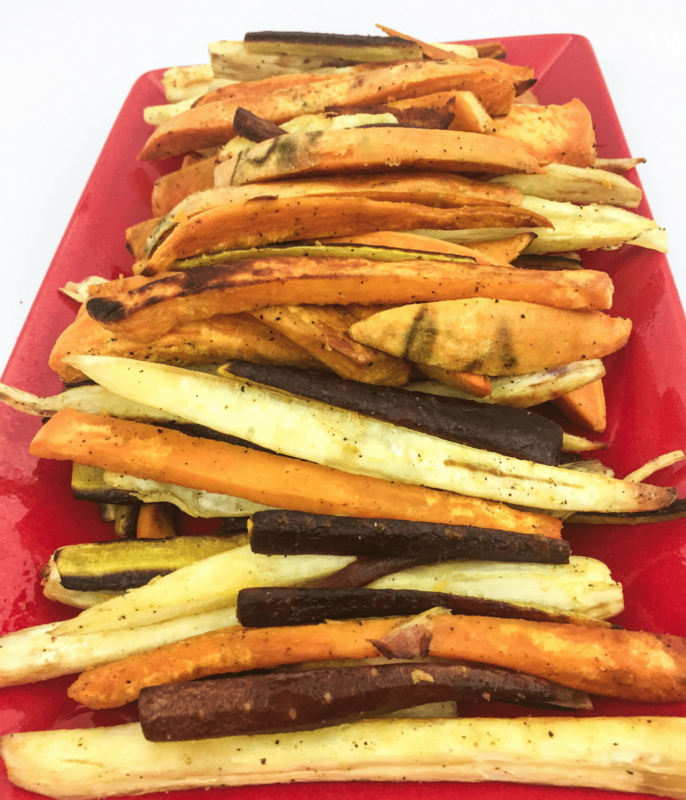 PLACE two baking sheets on the top and bottom thirds of oven, and preheat to 450 degrees F.
TOSS the carrots, yuca, and sweet potatoes with the olive oil, granulated garlic, salt, and several grinds of black pepper. Divide between the preheated baking sheets. BAKE until crisp and golden, rotating the baking sheets from top to bottom and tossing the fries halfway through, for a total bake time of 20 minutes. MEANWHILE, mix the sour cream, mustard, and a generous grinding of pepper in a small bowl. TRANSFER the fries to a serving platter, and serve with mustard dip. 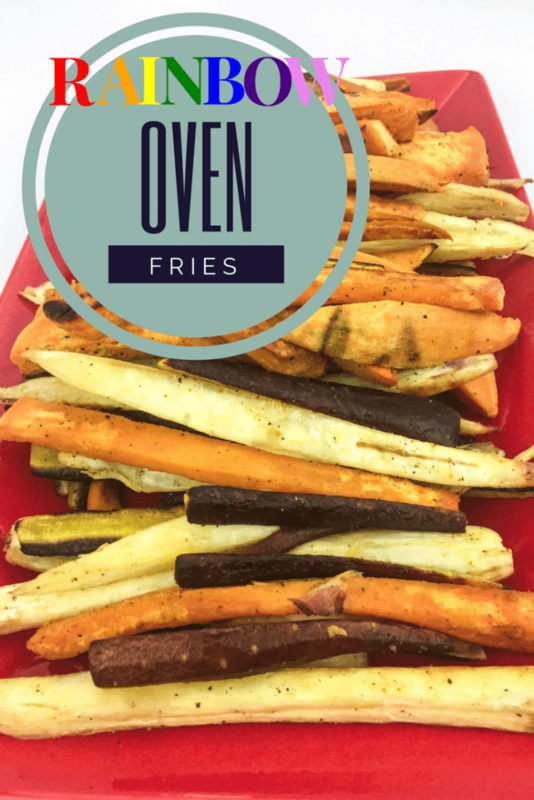 Make a colorful game day snack with garlicky seasoned oven rainbow oven fries. 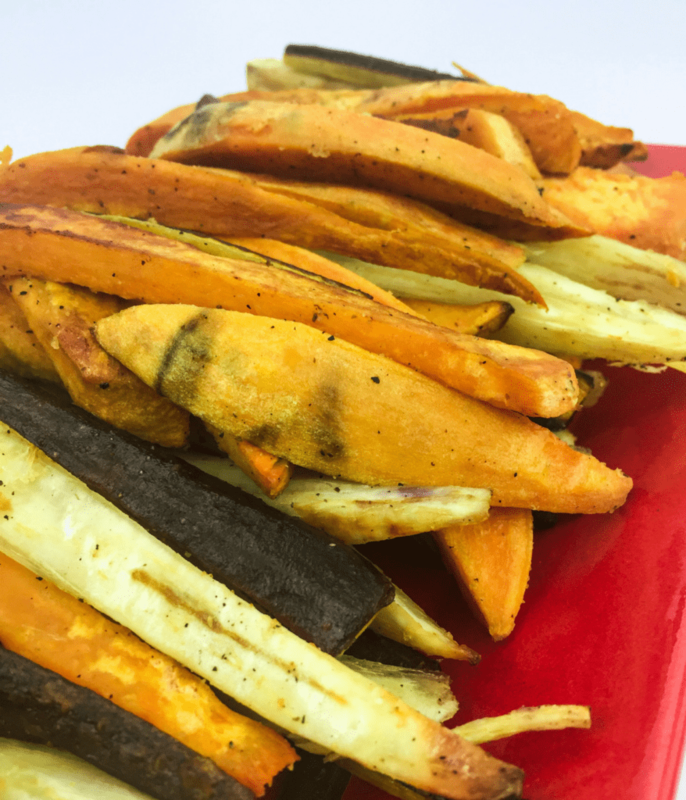 Made with sweet potatoes, yuca root, and purple carrots, this recipe is AIP, Paleo, and Plant Paradox compliant. PLACE two baking sheets on the top and bottom thirds of an oven, and preheat to 450 F.
BAKE until crisp and golden, rotating the baking sheets from top to bottom and tossing the fries halfway through, about 20 minutes. TRANSFER the fries to a serving platter and serve with the mustard dip. Will definitely try this recipe. 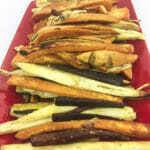 Root vegetables are so tasty even without the oil, garlic and salt. Welcome to Lectin Free Mama! Hi there! 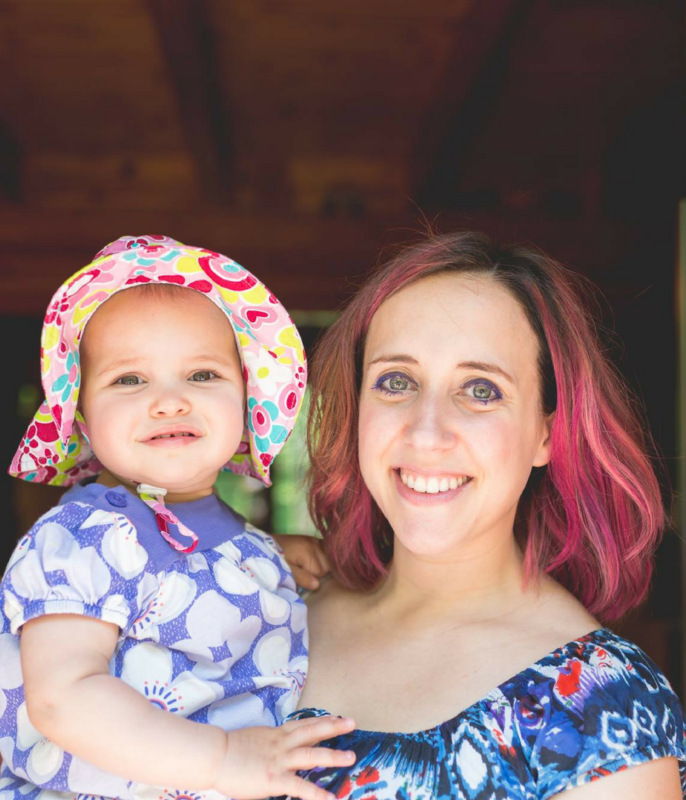 My name is Autumn–I’m a wife, mother, and classical singer who suffered for years from mold toxicity and POTS. 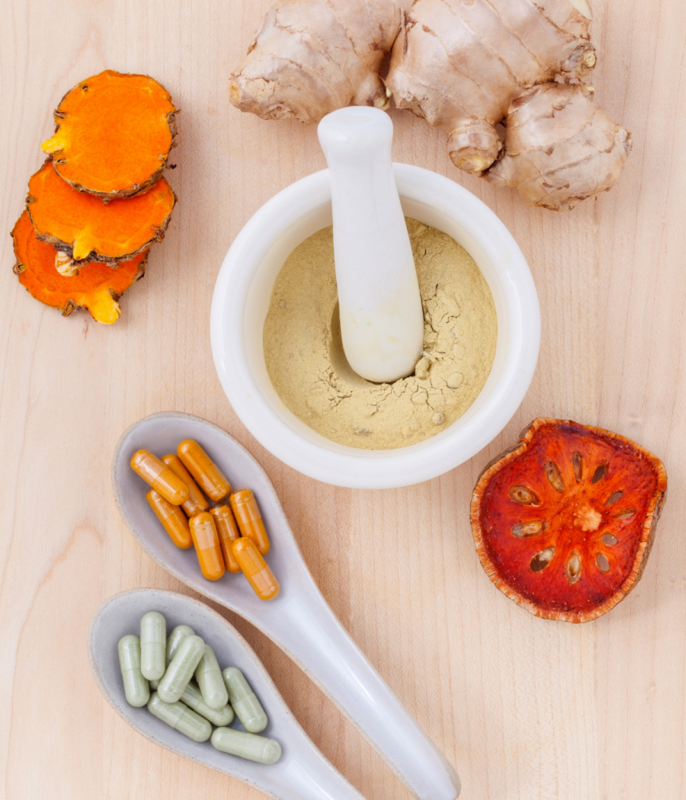 Dr. Steven Gundry’s Plant Paradox lifestyle has been an integral part of my family’s healing journey, and I hope to share here what I’ve learned along the way. 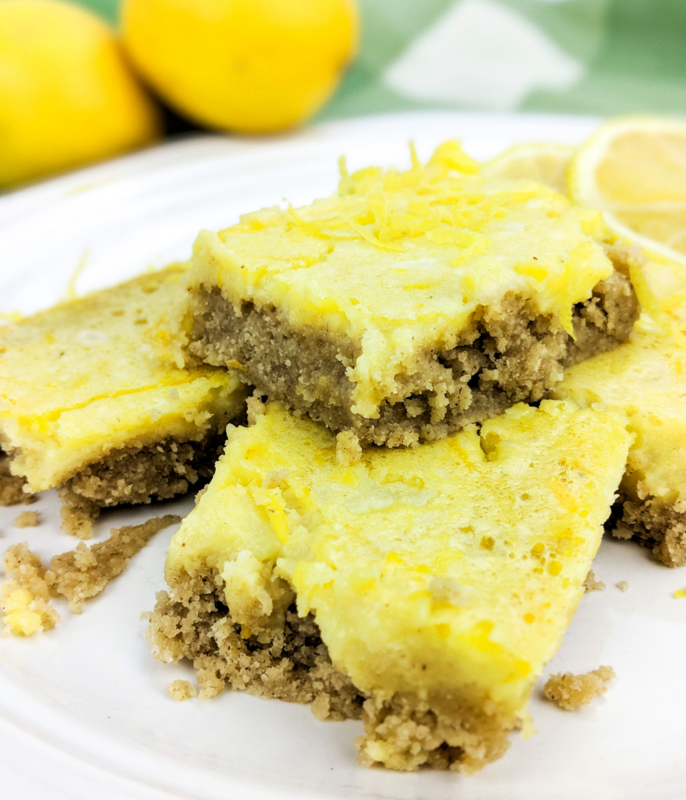 My goal with this site is to provide knowledge, resources, and healthy recipes to individuals and families recovering from inflammatory illnesses. Also, I want to give hope to the chronically ill that your story isn’t over yet–there are always more changes to pursue and more therapies to try. Never, ever give up scaling the cliff face–even when the top is not in sight. 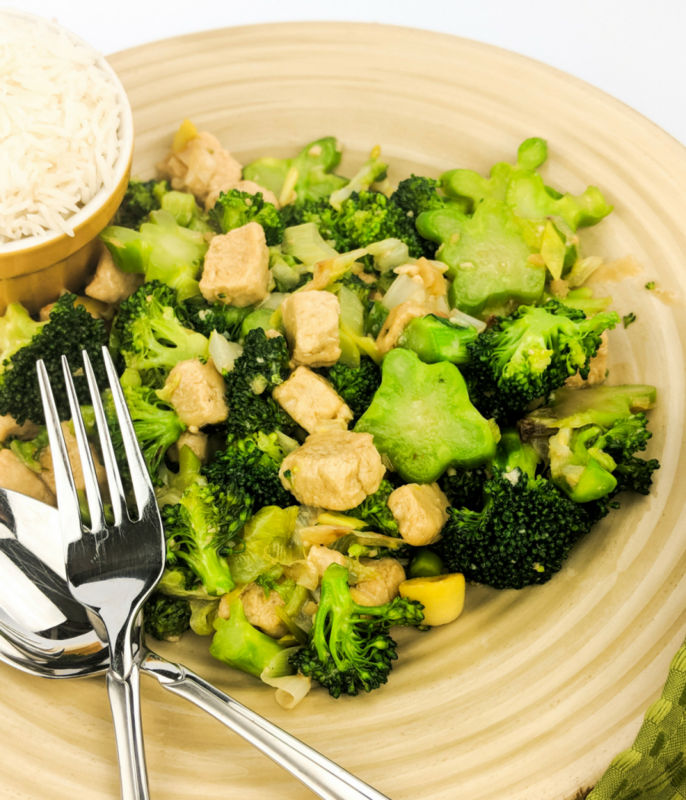 Check out my lectin-free meal planner (newsletter), recipes, tips, and research articles. Send me an email with any questions you have! 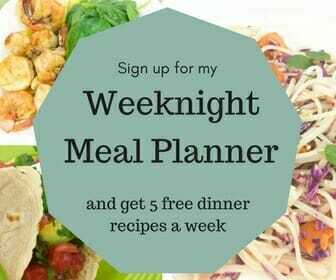 Sign up to get 5 recipes a week in your inbox. Copyright © 2016. Created By Lucid Themes | WordPress Speed Up for LectinFreeMama.com was performed by WpFASTER!